Well, maybe it has been a few days longer than a week! That's partly because it has taken a little tinkering to fit my UltiBots D300 delta printer with Palette due to the large Z axes. 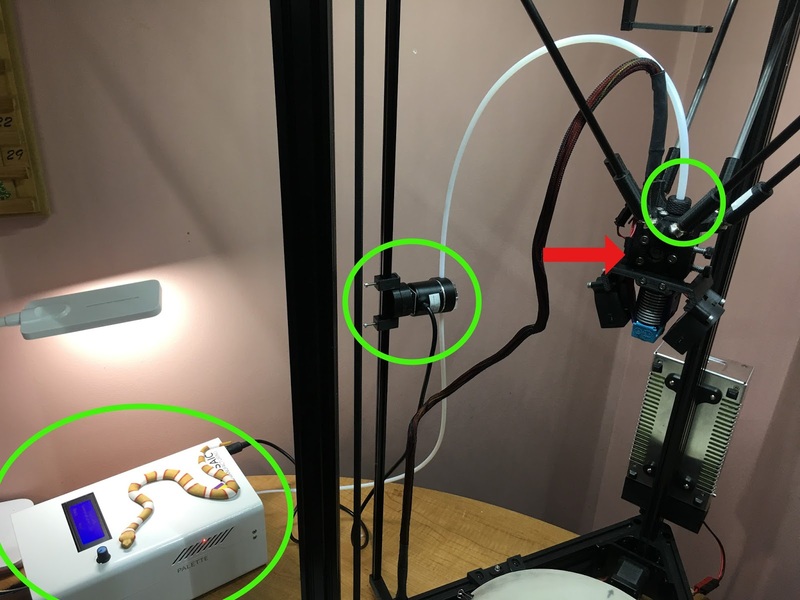 The Palette requires that the tube from the Scroll Wheel to the extruder (in my case, this is the UltiBots Micro Extruder mounted on the effector) have as gentle an arc as possible. Not an easy task for a printer with a 450mm range! But with a little experimentation I came up with a great solution that will work on any delta. The Scroll Wheel - circled in green in the middle of the photo - is mounted on a rotating base. This allows the tube to seek a natural and gentle bend as the delta's effector moves up and down and across the X-Y plane. I've published the STLs on my Thingiverse page: Mosaic Palette Swivel Scroll Wheel Mount. The swivel mount is attached to a 4th column positioned between the X and Z columns and offset about 150mm. I used a 10x10 aluminum extrusion for this. I will post my mount STLs but I have to figure out how best to hold the column in place since I can't find anything that will slide into the slots on this small extrusion. Once mounted, I ran a few movement tests to find the optimal position for the Scroll Wheel. Turns out that halfway is ideal. Ok, so now I had the palette attached, it was time to learn to calibrate and print. Calibration is actually straightforward once you understand what is supposed to happen. In my case, I believe my Scroll Wheel connector was not attached completely to the Palette so it did not register when filament moved through it. Jonny and Brennan at Mosaic were very helpful and answered my emails at all hours on the weekend to help me get up and running. Brennan even spent an hour on the phone with me to describe in technical detail how the Palette works. After I sorted out calibration I chose a simple and quick print to test, the Multi-color Citrus Coaster. I chose to do a pink grapefruit version for my first print. With this first print behind me it was time to start working on my own project. 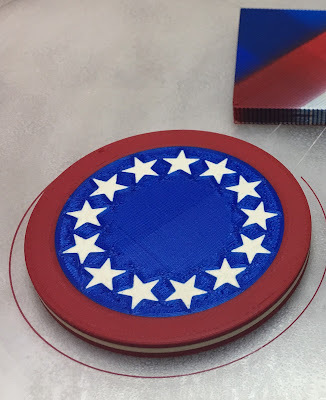 For a couple of years I've had a desire to 3D print a US flag themed red, white and blue fly fishing reel. I decided to start with a simple "coaster" version of that to work out the details. 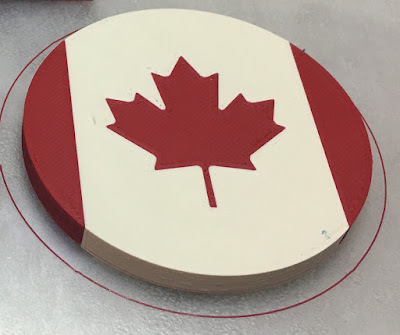 I realized that Canada Day (July 1st) and the US Fourth of July were coming up in a few days so I expanded my design to include a Canada Day and a Fourth of July Coaster. You can get the STLs at Thingiverse: Fourth of July Coaster, Canada Day Coaster. These were printed in a new PLA filament I'm testing: Filamentum Extrafill Nobble Blue, Extrafill Signal Red and Extrafill Light Ivory. I ordered mine (plus a few more colors) from filamentone.com (tell them SublimeLayers sent you of you order). I printed a couple of these, each better than the previous as I tuned in slicer settings. Sidebar on this: The Palette worked completely predictably during these tests and print quality issues had nothing to do with it. Palette only supports two slicers right now, Cura and simplify3d. I really don't like either slicer but support seems to be better for s3d so I went with it. Soapbox This does not imply that I will be advocating or recommending s3d anytime in the near future, I still have significant issues with both the company and the heinous bugs that have not been fixed for several years - including my old friend the "corner artifact bug" I reported exactly two years ago and was told "it's not a bug". No other slicer has a problem with this geometry. And here it is again in the US coaster - you can see it makes the stars look horrible. I was not able to get a clean print of the star field in blue in the Fourth of July coaster due to the s3d bug. I going to try Cura soon to see if I can tolerate it more. Next, just for giggles, I decided to print this multi-color owl. I'm not that into printing figurines but I wanted to test some more Filamentum colors and this seemed like a good model. The owl is printed in Filamentum Vertigo Grey, Metallic Grey, Ivory and Gold Happens. I really like this filament - it prints beautifully, the colors are rich and not overly saturated and they really hide layer lines. Now I'm working on the US flag fly fishing reel that's been bouncing around my head for a few years. I'll be using Cura to slice it since it's critical that the stars look perfect. I'll make a post showing how Cura, Kisslicer and Slic3r PE handle these stars compared to s3d. 11 comments to ''First week with the Mosaic Palette"
I read that the new palette+ is much more reliable as far as bonding strength is concerned. Just like you, I have been tempted to buy one several times but I am still on the sidelines as the teething problems get sorted out (including the software). Would be interesting to hear your take! Claude, my experience has been that the Palette - and especially the Palette+ - are very reliable and my prefered means of multi-color and multi-material prints. It does require some printing experience under your belt, but the Chroma software really takes a lot of the tedium and difficulty out of the process. Your comment about allowing for direct drive is critical in my experience. The Prusa MM upgrade with its relatively short Bowdens does not print nearly as cleanly as the stock direct drive extruder. And, since it is a one-way upgrade, you can't simply bypass it to get excellent single material prints. Palette is completely unobtrusive so printing a single filament will not be affected. The place where Mosaic is really coming through is with the software. The new 2.2 release adds features to reduce the size of the transition tower - which saves both filament and, especially, time to print. More enhancements are coming on both the firmware and application. As far as multi-color printing, Palette+ is very reliable for PLA, ABS and PETG prints. Most multi-material prints like soluble supports with PLA or ABS or PLA-PETG, etc are also reliable. Support for TPU and multi-media TPU- prints is experimental and requires great attention to detail, experience and a couple of simple modifications (printed parts) to the P+. But TPU is a bugger for most people on its own! - does not alter your stock printer - this is huge and allows for direct drive extruders. - finally, Mosaic as a company is First Class in my book. They support their customers, they believe, passionately, in what they are doing and are really pushing the innovation envelope. Anyhow, MM is ruled out as an option, my MK3 is supposed to remain a reliable work horse (once I receive the package) and I will look into Mosaics software and have my mouth watering for the time being. Good luck and don't hesitate to ask questions if you have them, I'm happy to help. Did you ever post an update with Cure/Kissslicer/Slic3r with these stars? Thank you. I'm not sure what an update would be. The stars are an STL and you slice it with your favorite slicer. Palette's Chroma app now supports KISSlicer so that is all I use currently. There is setup info for KISS on the Mosaic web site. The very last sentence of your post: "I'll make a post showing how Cura, Kisslicer and Slic3r PE handle these stars compared to s3d." -- I was wondering if you ever did that as I couldn't find it. I'm an S3D user who has been intrigued by KISS from your posts (and I've got a Pallete+ I'll unbox at some point...). I wanted to see first hand the differences in how each of the slicers handled the points on the stars. Thank you for responding. I noticed that they support KISSlicer now. Have you tried the Pallette+ with KISSlicer yet? My Pallette+ is arriving today so I look forward to printing some challenging muti color/material parts. Yes they do and yes I have! I only use KISS with my Palletes now. Follow the instructions on their website for setting up the KISS profile. Be aware that you can't use the adaptive layer height feature yet. Have you used the Pallette with the zesty nimble? I you have how did you connect the pallette+ tube to the top of the nimble? No, I only run my palette using BondTech extruders.